Don’t miss the exclusive world premiere of Kenny Chesney’s brand new music video, “You and Tequila,” featuring Grace Potter. In addition to the premiere, Chesney takes you behind the scenes of the video and discusses his latest single from his album Hemingway’s Whiskey. Catch the show Friday, June 3rd at 10:45/9:45 AM ET/PT. It’s been nearly a month since the town of Tuscaloosa, Alabama was hit by a massive tornado, but on Wednesday night the town got to forget about it for a while. 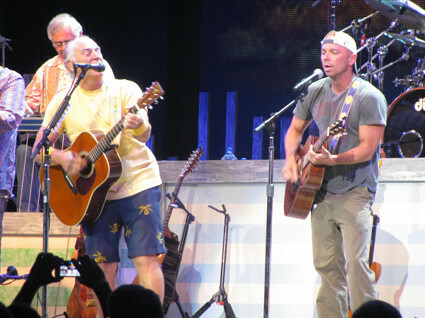 Kenny Chesney performed under clear skies for over 7,400 fans and donated the proceeds to the recovery efforts. Although potential storms were predicted for later in the night, there wasn’t a cloud up above the waving inflatables, the lines of early eager fans and Hooters girls perched out front. Even the Federal Emergency Management Agency workers handing out information on givetuscaloosa.com, dedicated to storm relief, were smiling and moving to the music. They might have been influenced by the star’s generous donation of all artists’ fees for himself, his band and management and booking representatives to Tuscaloosa for its ongoing recovery. Chesney gave a short heartfelt speech to lead into the emotional highlight of the evening. “The whole world knows this town is hurting,” he said. “And the fact you came to see us play means a whole lot of money is going to help Tuscaloosa. “We couldn’t be prouder to be playing here; we only do this song when we play here,” he said, launching into “My Home’s in Alabama,” with the help of several thousand voices. The concert was sold out, at about 7,470 seats. About halfway through the show, he brought out Muscle Shoals singer-songwriter Mac McAnally, a regular with Jimmy Buffett’s Coral Reefer Band, to play and co-sing the McAnally song “Down the Road,” which Chesney took to No. 1 in 1990. Remember to keep voting for Kenny for the 2011 CMT Music Awards! According to The Boot, Kenny Chesney is in the June issue of Boating Magazine, where he discusses his boats and love of boating. he recorded a song titled ‘Boats’ for his ‘Lucky Old Sun’ album, and it includes the lines, “vessels of freedom/harbors of healing,” which is very apropos to how he feels when he’s riding the waves. Kenny currently has two Sea Rays, a 56- and a 60-footer, although he admits he’s a little bit more fond of the 60-foot boat. One of his favorite boating memories is right after he purchased his first vessel. When you have your hands on all aspects of your business like Kenny Chesney does, it’s hard to have a surprise pulled over on you, especially on your own stage. But Saturday night in Lexington, KY, after weeks of under-the-radar-preparation, when Chesney took the stage, a bus with a special guest pulled into the backstage parking area. So, halfway into the show, just before an acoustic part of the set, friend and musical icon George Jones walked on stage. As the crowd goes completely wild, Chesney is unaware that Jones is walking towards him. And just as he turns around, Jones meets him mid-stage to a completely shocked Chesney.